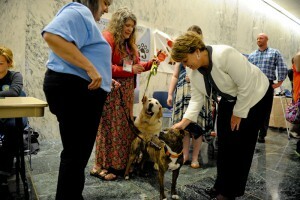 Senator Ritchie is pictured at the Capitol with visitors from Paws Across Oswego County, a non-profit animal rescue. The State Senate marked “Animal Advocacy Day” at the State Capitol Wednesday by passing a series of bills to protect animals, including a measure sponsored by Senator Patty Ritchie that would double prison sentences for abusing an animal in the presence of a child. The bill, S.4641, would double the maximum sentence, to up to four years in prison, for animal abuse when a child is present. The measure was one of 10 bills approved by the Senate that seek to protect animals from abuse and maltreatment, and crack down on “pet theft” and abandonment of animals. Meantime, Senator Ritchie announced that 75 pets have now been featured as part of her Pet of the Week initiative, in which pictures and information about adoptable cats and dogs from the Jefferson County SPCA, Oswego County Humane Society and St. Lawrence Valley SPCA are published on her official website, and on her Facebook social media page. According to the shelters, the effort has helped to raise interest in adoption. * Legislation that strengthens penalties for theft and mistreatment of pets. This new measure will increase the maximum fine, for the first time since 1970, from $200 to $1,000 for those who harm, steal or transport a pet that’s not their own.